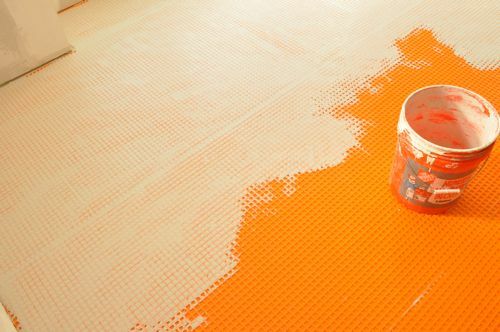 There’s a lot of information (and mis-information) online about what constitutes a suitable subfloor for tile, and it’s tough to find a clear answer. 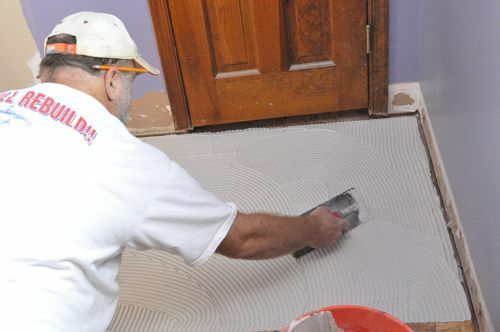 The difficulty is that tile can be installed over a number of substrates, and each requires specific preparations to ensure a long-lasting tile floor. To determine the requirements for a tile subfloor, I partnered with Jim and Rich from Diamond Tile located here in Maryland. Jim and Rich are professional tile installers with over 27 years of experience and have worked with a variety of tile substrates. 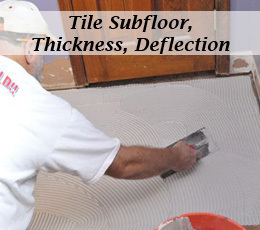 Deflection, or bounciness, can cause tiles and grout to crack or come loose, and the tolerance depends on what type of tile is being installed. For instance, ceramic tile can withstand more deflection than natural stone. Many tile contractors can judge a floor’s deflection by walking around. To calculate a specific value, the Tile Council of North America (TCNA) offers a standard formula. Divide the total span of the floor joists (in inches) by 360 to determine the maximum amount the floor can give in the middle under a live load of 40 lb./sq. ft., plus any long-term deflection due to the weight of the floor. For example, the maximum deflection for a joist span of 15′ is [15 * 12] / 360 = 1/2″. The L/360 formula is useful for most ceramic, porcelain, and hard stone. For soft-stone tile, such as limestone or light marble, the L/720 formula applies (cutting the maximum allowable deflection in half). John Bridge Forum also offers this helpful deflection calculator. According to TCNA, there are several factors that affect deflection including condition of the subfloor and joists, joist size, type and spacing, and how the subfloor was fastened. Adding another layer of plywood can reduce deflection and curvature of the sheathing between joists. In the past Jim and Rich have glued and screwed plywood, taking care to stagger the joints and gap the panels 1/8″ on each edge. Schluter recommends using ring shank nails or screws, turning panels perpendicular to joists and not aligning joints with joists (pg. 23 of DITRA Handbook). In extreme cases Jim and Rich have advised additional joists be put in place. Plywood and OSB are the two most common materials used for floor decking, and typically they are 5/8″ or 3/4″ thick. In this scenario, Jim and Rich install 1/2″ cementious backer unit (CBU) resulting in at least an 1-1/8″ thick subfloor. If they install a second layer of wood underlayment (3/8″ plywood or thicker), the guys would use 1/4″ CBU on top. Older homes may have a structural plank subfloor, and these can be problematic because they move so much with changes in humidity. In this case, the guys usually install 1/2″ plywood overtop and 1/4″ CBU or DITRA. Installers sometimes use fir plywood in lieu of CBU. While acceptable, Jim and Rich prefer concrete board because plywood can contain voids, and in rare cases the plywood may delaminate. Also, mortar creates a stronger bond with a concrete board. It’s also common to see tile installed over a concrete subfloor, and the big concern is movement from cracks, or expansion / contraction. Jim and Rich often flash the floor to create a flat surface, and they always recommend installing an uncoupling membrane like DITRA overtop concrete. Tile can be installed directly over existing tile given that it is free of cracks and there are no loose tiles. Jim and Rich advise using a bond-promoting primer to enable the mortar to better adhere to the existing floor, and to set the floor with a specialty polymer modified mortar. If the floor is uneven, it can be flattened just like a wood or concrete subfloor. Jim and Rich don’t advise tiling over resilient flooring. It’s too risky not knowing the condition and materials of the subfloor, and so they always remove resilient flooring. Over a cement subfloor (basement), is it safe to lay any type of tile? I assume defection is not an issue there. Moisture and cracks are the two things you’d need to worry about with a concrete subfloor (assuming it’s nice and flat). Good tutorial. Next we will need a tutorial of how to install a threshold between the tile floor and other floors in the house. The general rule seems to be that if you want a solid tile floor, the way to do it is to install more, thicker layers below the tile. In some cases, this could result in the tile being significantly higher than the floors elsewhere. That’s a tricky issue indeed. Ditra can also be laid directly on a flat plywood subfloor using a latex modified mortar; especially for tiles that only require L/360 deflection standards. Ditra only adds about 1/8″ to the overall height. Schluter Systems (the makers of Ditra) have a lot of pretty good misc metal products for doing tile transitions. Many of them have a more modern look to them but the quality is very high. I use the Jolly line on all shower alcoves instead of using bullnose tiles. I never liked the look of the much smaller bullnose tiles. Homedepot carries some of the metals line in stock but I think they can order the rest of it as well. Nice write-up Ethan. You’d be surprised how many people will try to argue with me that it doesn’t matter which way you lay the grain of plywood. The thing is that people can have successful tile installations without all the prep work because sometimes you just get lucky. That makes people think they can always skip over important details like thinsetting the cement board when that’s not the case. Moving into a house where the current kitchen floor is linoleum with likely asbestos. For obvious reasons, I don’t want to pull it up. Any issues with putting tile right over top? Best practices? Thanks. The guys advise against tiling right over linoleum because you don’t know the condition of the subfloor and a proud staple could cause tiles to crack. You can send in a sample of your floor to an asbestos testing lab. If you’re lucky, it’ll come back negative. If not, it’s probably worth hiring a knowledgable contractor. Ethan, thanks. Where do you see that advice? We already had an environmental consultant out because the outside tiles have asbestos as does some of the duct work in the basement. He quickly looked at the linoleum and was pretty certain that it had asbestos. I know it’s been a while, but I notice a lot still look at this page. If you are from Canada which this seems to be showing up in. I found mine from http://asbestostestingservice.ca/ which I felt was pretty cheap. Kind of a deflection question… I need some advice… our house in Florida had laminate wood floors; we took them out but there is a rubberized foam type underlayment (sound barrier) that is glued to the concrete slab. Its almost impossible to remove and it’s throughout the house. Can I lay tile over the underlayment without worry that my ceramic tile (wood plank style, 6″x20″) may crack due to deflection or “give” from the underlayment? Thanks in advance. I have a bathroom with 1-1/8 in plywood subfloor. The cement board I was trying to install was not sitting completely flat on the subfloor. One edge was raised about 1/8 inch off the floor so I poured a self leveling underlayment at a thickness of 1/4 inch. Now I have a completely flat floor. Where do I go from here? 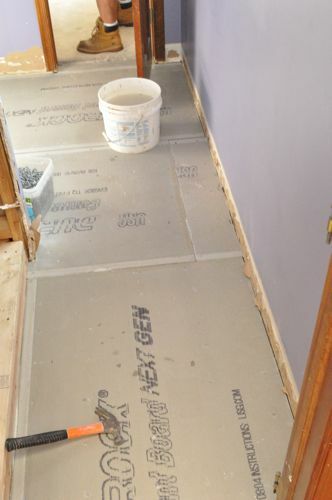 Do I place a cement board over this underlayment….Do I place ditra over it….or do I proceed directly to tile? We are planning to lay the DITRA system under tile in our bathroom. The bathroom currently has linoleum as the flooring surface, a good subfloor under that. Can we lay the DITRA on top of the linoleum directly or does it have to be removed. I was installing Dri core planks as a sub floor. The 2’/2′ in my basement and noticed that the floor, even though I thought is created right was dipping in sweating areas. So I have a dead line in a week and a half and I quickly decided to use cement boards to get level. Is that ok. I’m going to lay down a vinyl floor 150 sq ‘. My kitchen is 9’x10′ concrete. The problem is there are two layers vinyl tile and one layer of ceramic. Floor cabinets have been pulled out and the layers are uneven. Tiling has been installed around cabinets. So, I now this will be a time consuming job. I wanted to extend the dining room tile into the kitchen to open it up because the rooms are small and it would have a nice flow. Tile size is 16×16. Which one would make more sense? Start over or add another layer? I just purchased a condominium unit in a 7 story building in downtown Chicago. My General Contractor told me that the people upstairs installed a large format tile floor directly on top of their existing hardwood floors (2.25′ solid red oak). I am experiencing an unbearable amount of noise from their footsteps including squeaking sounds and my whole place shakes. They were too cheap to take out the existing floor and replace it with new floor. Can you explain to me what is happening? If its allowed, what would be the proper installation instructions? And, while this is a cement construction building, I’m afraid of this being a safety issue if the floor can’t support the load/weight of these double stacked hard flooring surfaces. Please help!!! I would be truly grateful. I’m planning on tiling our kitchen. The joists are spaced on 16 inch centers and have a span of 14 feet. The joists actual depth are 9 inches so I’m assuming they are 2X10. The subfloor is 5/8 T&G. We are planning on using ceramic tile with granite counter tops. Most of the cabinets are on the perimeter on the room with a peninsula that runs to the center of the room (7′ from the outside wall). I have visited several tile stores and received conflicting subfloor thickness requirements. Some say I’m OK with 1/4″ cement board. I only want to do this once. Any help would be welcomed. My house has two layers of hardwood floor and a 1/4 inch integraply underlayment which I a total of 1 3/4 inches of floor. Should I put down 1/4 inch durock or densShield and should I put thinset under the cement board?